Media headlines in recent days have been splashed with a slew of rather tense and at times, bleak, news, such as, notably, the South China Sea disputes, the U.S. Navy’s freedom of navigation operations, and the spate of ship collisions in the Indo-Pacific. These tend to provoke questions about ASEAN unity despite the bloc’s long-touted centrality in the regional security architecture, as well as the durability of U.S. security commitment as a stabilizing power. But amidst the air of geopolitical pessimism, one often overlooks the amount of work that takes place behind the scene between navies and coastguards in the Indo-Pacific. This is indeed the case for activities customarily undertaken by Indo-Pacific maritime practitioners, as we can collectively label those professionals in the navies and coastguards. Besides their usual fare of daily, routine policing of waters under their national sovereignty and jurisdiction, these actors interact with each other regularly – well behind the scene of grander-scale geopolitics between governments in the region. While it is unwise to decouple politics and interstate cooperation, it is also misleading to conflate them. Geopolitical upheavals may stymie maritime security cooperation, but not all the time. But when it comes to cooperation at sea, one needs to distinguish between practical maritime security cooperation measures (PMSCMs) and dedicated confidence- and security-building measures. The former is primarily aimed at addressing functional challenges at sea, which involve at a greater scale those maritime practitioners and their tools. PMSCMs of course have a confidence-building effect, but this is not what they are primarily designed for. PMSCMs in the Indo-Pacific have evolved since the early-2000s, especially following the September 11, 2001 attacks, with a boom in multilateral initiatives based on common understanding between governments in the region that terrorism constituted a challenge that requires collective solution. No single state can handle this threat alone, given its transnational spillovers and impact in an interdependent and interconnected world. These new initiatives centered around ASEAN and its associated institutions, chiefly the ASEAN Regional Forum, ASEAN Defense Ministers Meeting and ADMM-Plus, as well as the ASEAN Maritime Forum and Expanded AMF. PMSCMs revolving around these multilateral institutions deal with the so-called “low hanging fruit” – topics that can generate common acceptance due to their urgency and low political sensitivity, yet at the same time catering to as wide a scope of participants as possible. The Southeast Asia Cooperation and Training exercises (SEACAT) are unlike those typical ASEAN-centric multilateral PMSCMs. It’s in a colloquial sense deemed ASEAN+1 format, led by the U.S. Navy. SEACAT began its life as Southeast Asia Cooperation against Terrorism (SEACAT) back in 2002, before being renamed in 2012 to reflect the expansion in security focus beyond merely terrorism, and related scope of training. Like previous iterations, the most recent 16th iteration of SEACAT aims to increase cooperation and information sharing among navies and coastguards across South and Southeast Asia. In a region where bilateral tie-ups tend to dominate, SEACAT counts as one of the earliest, bold attempts to foster multilateral PMSCMs in the Indo-Pacific. Comprising both shore and sea training phases, SEACAT rehearses scenarios related to unconventional maritime security challenges such as piracy and seaborne smuggling. It emphasizes maritime domain awareness through timely information sharing and coordination of responses between the participants. That’s where skeptics may express their doubts about the efficacy of such arrangements. To take just one example, didn’t previous incidents such as the loss of Malaysia Airlines flight MH370 expose weaknesses in information-sharing due to enduring mutual distrust and suspicion? In fact, SEACAT has over the years grown in complexity and participation. 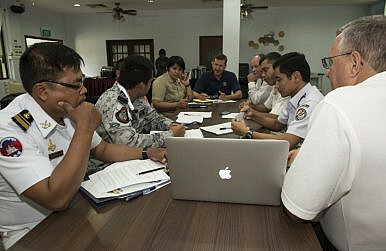 The exercise in August last year saw the participation of coastguard personnel from Bangladesh, Indonesia, Malaysia, the Philippines and the United States. This year’s SEACAT saw the largest number of navies participating, including Myanmar and Sri Lanka joining for the first time. More pertinent is to point out that these encouraging trends are driven by the scourge of extremism and terrorism. The presence of the Islamic State and local terrorist groups in Southeast Asia inspired by this organization constitute more than sufficient grounds for concerns among chiefly ASEAN governments. The instinct for some is to assume that, the more participants, the greater the efficacy of such PMSCMs as SEACAT. But the reality is that, it depends on several factors such as the type of threat it is designed to address, the nature of the activity, and the relative capabilities and capacities offered by those various participants. Like typical ASEAN-wide multilateral PMSCMs involving so many participants, there are bound to be challenges. On whether SEACAT will grow in participation, particularly in terms of involving countries in Northeast Asia, Gabrielson pointed out that the exercise is underpinned by an inclusive concept, such that any other interested parties may also participate. But he also cautioned that expanding participation needs to consider practical limitations. For one, besides disparities in terms of capabilities and capacities each participant can offer to the table, navies and coastguards do have distinct organizational cultures and operational doctrines. Hence, complexities can be observed at two levels – the first being inter-agency within each participating country; the second being interstate involving these diverse national agencies. Such broad-participation, multilateral PMSCMs as SEACAT and ARF maritime security field training exercises for instance are here to stay. They are painstakingly built up over the years, allowing regional maritime practitioners to sidestep political differences and push forward collective solutions to common challenges at sea. Governments in the Indo-Pacific are not anywhere close to ditching them and forgo those years of having accumulated habits of collaboration, level of trust and familiarity with each other. Moreover, they would come in handy as platforms on which regional governments can build enhanced PMSCMs to adapt to the evolving maritime security environment. In fact, there are reasons to believe that multilateralism in maritime security cooperation looks set to persist as the pathway to adopt. The evolving nature of threats in the maritime domain necessitates more players to pool their strengths. Also, while coping with limited capacity, the U.S. Navy as a key Indo-Pacific maritime player would find it expedient to promote greater empowerment of allies and partners in the region to share burden, and increase their involvement in coping with a diverse array of those threats. This harks back to the Asia-Pacific Maritime Security Strategy, published by the U.S. Department of Defense in 2015, which pointed out that “working in concert with regional allies and partners” would enable more effective response to maritime crises. In this regard, besides stressing forward naval presence, the Strategy calls for cooperation with regional allies and partners to build their maritime capacity, which entails “greater interoperability, updating our combined exercises, developing more integrated operations, and cooperatively developing partner maritime domain awareness and maritime security capabilities” to ensure a strong collective capacity to employ these capacities more effectively. “We are increasing the size, frequency, and sophistication of our regional exercise program, with a particular focus on developing new exercises with Southeast Asian partners and expanding our multilateral exercise program. We have also begun incorporating a maritime focus into many of these engagements in order to tailor our training to address regional partners’ evolving requirements,” the Strategy noted. SEACAT certainly reflects a continuity of this direction. Yet it also means more than just evolving the scope of existing initiatives and creating new ones. Though not specifically spelled out in the Strategy, one should also consider the roles played by other major powers besides the United States in helping to build maritime security capacities in the Indo-Pacific. Such assistance come in the form of fiscal, technical as well as training initiatives. Recent years saw the emergence of these players entering the fray, though their underlying intent is always subject to speculations and debate. For instance, Indian and Japanese assistance to regional maritime security capacity-building are perceived to be aimed at containing China. Yet emphasizing this aspect overlooks the fact that such assistance generate positive effects in enhancing maritime security. Provision of Multi-Role Rescue Vessels to the Philippine Coast Guard might be regarded by some as part of Japan’s attempt to counter China in Southeast Asia, but it is necessary to point out that those same vessels were almost immediately thrown into action, notably patrolling the Sulu Sea against armed militants perpetuating those kidnap-for-ransom incidents. The MRRV, as its name implies, is designed for several missions – search-and-rescue, counter-piracy, sovereignty patrols, you name it. One MRRV, the BRP Suluan, participated in the field training phase of this year’s SEACAT. It is more worthwhile to focus on how such capacity-building assistance contributes to enhancing the overall ability of Indo-Pacific governments in dealing with recurrent maritime security problems on a daily basis. The regional maritime security environment is not simply just about interstate disputes. In this regard, offerings of these major powers, such as Beijing’s Vision for Maritime Cooperation under the Belt and Road Initiative that incorporates provisions for maritime security capacity-building assistance, and Tokyo’s announcement to set aside US$500 million to bolster Indo-Pacific coastal states’ maritime security capabilities, should be embraced. Besides ASEAN-centric institutions and maritime capacity-building assistance done in mostly bilateral and increasingly multilateral formats, the Indo-Pacific may see growing interest in what we may call “mini-lateral” PMSCMs. These are essentially “coalitions of the willing” comprising local actors who share a common maritime area of interest. Compared to broad-participation, multilateral PMSCMs such as SEACAT, such initiatives are easier to establish, since less actors are involved which translates also to having to overcome potentially less political differences as well as disparities in capabilities and capacities. Moreover, these “coalitions of the willing” can tap on pre-existing habits of cooperation, and allow participants to build on trust and operational familiarity. The Malacca Straits Patrols (MSP) have been upheld as a noteworthy example of this “mini-lateral” PMSCM. This framework comprises only the littoral states of the strategic waterway – Indonesia, Malaysia, Singapore and Thailand. The Trilateral Cooperative Arrangement (TCA) between Indonesia, Malaysia and the Philippines, designed to cope with the Sulu/Celebes Seas militant challenge, is the second, most recent example of such emerging patterns of cooperation. The TCA is in fact modeled partially on the proven MSP. Given the expediency of localized maritime security challenges and comparatively greater ease – both politically, operationally and technically speaking – in formulating such mini-lateral responses, such “coalitions of the willing” PMSCMs are set to proliferate in the Indo-Pacific. Interwoven but More Complicated Web of Cooperation? What is the future vision we could expect of maritime security cooperation in the Indo-Pacific? Some may desire a single umbrella institution under which regional cooperation can take place to cope with the evolving maritime security environment. But a more pragmatic way is to envisage the durability of interwoven web of bilateral, multilateral and mini-lateral PMSCMs, interlinking various actors on multiple platforms. Notwithstanding the recent woes experienced by the U.S. Navy in the Western Pacific region, it is expected to see U.S.-led initiatives such as SEACAT continue to exist and possibly expand. And so the case of the traditional “hub and spoke” system of US alliances and partnerships, which have been built carefully over the decades since the Cold War and having survived and adapted to changing geopolitical circumstances till this day. ASEAN-centric PMSCMs such as ARF and ADMM-Plus continue to be relevant, albeit unwieldy at times due to the broad extent of participation and disparities in capabilities and capacities, confluence of diverse actor interests and hence limitations in the scope of activities. These broader multilateral mechanisms will remain valuable as platforms to bring these participants together to discuss pertinent maritime security problems, and engage in less sensitive PMSCMs in a limited form. But co-existing alongside these existing PMSCMs will be the emergence of major Indo-Pacific players seeking a greater part in managing the regional maritime environment – complementing and filling voids in those roles traditionally filled by the US since 1945. These major actors bring along niche capabilities that can contribute to the well-being of the Indo-Pacific maritime commons, and it would be more constructive to emphasize the positive than negative aspects of such capacity-building assistance. Finally, we may also expect smaller players such as those in Southeast Asia to step up to the plate and take on greater burden in handling maritime challenges within their immediate neighborhood, while accepting capacity-building help from the stronger and better endowed extra-regional powers. Will this hodgepodge of diverse PMSCMs complicate issues? That is unlikely. Rather than compelling the formation of a single umbrella institution of PMSCMs that may bring to bear existing geopolitical dynamics, much of which underpinned by historical animosities and contemporary acrimony over such issues as maritime sovereignty and jurisdiction, it would be politically more stable and in fact, pragmatic in the operational and technical sense to rely on this interwoven web of cooperation to ensure safe and secure seas in the Indo-Pacific. Koh Swee Lean Collin is research fellow with the Maritime Security Programme, at the S. Rajaratnam School of International Studies, based at Nanyang Technological University, Singapore.